Mohammed Dahlan hits back at PA Chairman who accused him of collaborating with Israel to assassinate a senior Hamas terrorist. 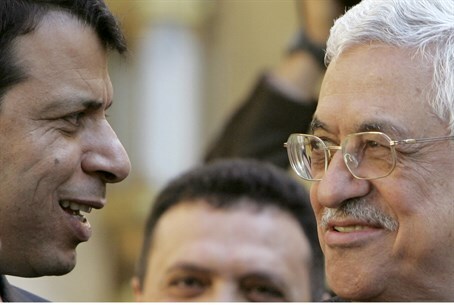 Mohammed Dahlan, longtime political rival of Palestinian Authority (PA) Chairman Mahmoud Abbas, has hit back at the PA leader after the latter accused him of collaborating with Israel to assassinate a senior Hamas terrorist. The interview was translated by the Middle East Media Research Institute. “Mahmoud Abbas no longer represents Fatah. He represents the negotiations, the destruction of the PA, the plundering of the PA, and all that is evil in the lives of the Palestinians,” said Dahlan. “Mahmoud Abbas says no pressure is being exerted upon him, and he tells his people to prepare the balloons to celebrate his steadfastness. Balloons?! When Yasser Arafat would travel to Washington, he would prepare the knives before talking about politics,” he added. In the past, Dahlan was also accused by PA officials of sending Israeli arms to former Libyan leader Muammar Qaddafi. Most recently, Dahlan made headlines again when the Ma’ariv newspaper claimed that Israel was carrying out secret talks with him, in preparation for a scenario in which Abbas steps down because he will refuse to sign an American negotiation framework.